Why Do You Fight To Hear Well When You Go to Parties? It’s a very basic question. You spend some adult time partying with friends and family, but something is off. You are standing in a space filled with adults like yourself, yet, it almost seems like you are on an island. Why? The biggest problem is you’re only hearing about every third word of the conversation. If the person you’re with has a high-pitched voice, you pick up even less. It seems unlikely that everyone else is mumbling, right? What are the odds? Slim, unfortunately, this probably isn’t an epidemic of mumbles. The more likely explanation is your hearing isn’t what it used to be and that’s interfering with your party joy. It’s also a fair guess that this is an ongoing problem, too. Maybe you notice that same mumble while at the grocery store or at the farmer’s market. Age-related hearing issues tend to rear their ugly head first in noisy environments. With everyone talking at once and maybe even music playing in the background, you’ll be struggling. 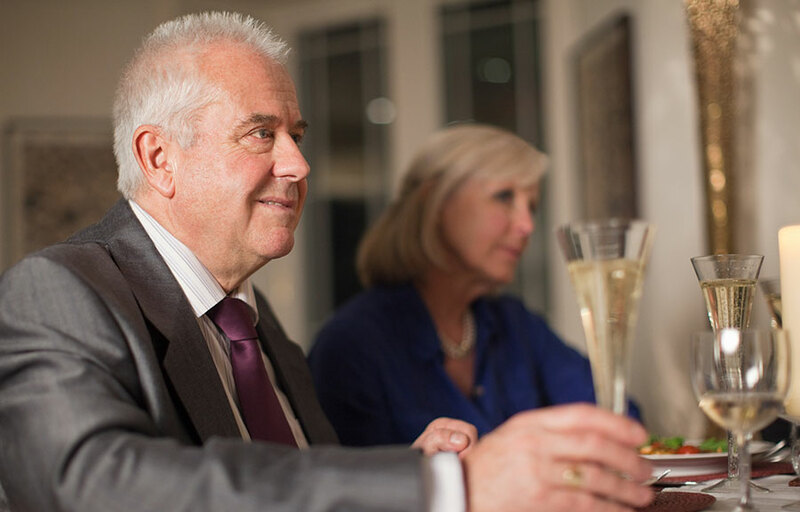 The first step is to educate yourself about age-related hearing loss and what you can do to combat it, so you can enjoy your next party without feeling like a loner. Presbycusis or age-related hearing loss is a condition often associated with people between the ages of 65 and 74, but it starts much younger. Simply put, the cause is natural wear and tear on the nerve cells in the ears. These cells send electrical impulses to the brain that it translates into the sound you hear. Sound actually comes in waves. Those waves enter the ear canal and travel to the inner ear for processing. That puts stress on the cells, so after about 50 or 60 years, they start to break down, especially for individuals who spend their life exposed to loud noises. Maybe you drove for the last 20 years with the windows down and the radio up or have been wearing earbuds to listen to music since they first hit the market. It’s these little things that put stress on the tiny hair cells of the inner ear. After years of dedicated service, they can no longer function and that makes hearing more difficult. Age-related hearing loss is a progressive condition, as well, meaning it starts small and grows worse over time. By age 65, most people start to notice a change, but it starts earlier in life. Can You Slow the Process? The trauma of age-related hearing loss is permanent. Once these cells suffer damage, there is no fix. The best course of action is to take good care of your ears and slow the process down. The right proactive steps may even save some of your hearing. If you are frequently exposed to loud noises, either at home or on the job, take steps to protect your ears. Lose the headphones and earbuds, for example. Look for ear protection when there is noise you can’t avoid like the lawnmower or equipment on the job. It’s what you do now that will matter the most later on, so treat your ears like delicate instruments because that’s exactly what they are — some of the most delicate in the human body. There are things you can do to improve your hearing at a party, too. Start by learning to face the people you’re talking to; it will improve your chances of hearing what they say. Try not to be shy about your hearing loss, either. The more open and honest you are with your friends, the better. Explain that you are having trouble understanding what they say. That one piece of information will get them to slow down when talking and turn up the volume a bit, so you can hear. The best plan of attack, though, is to get your hearing checked. If you can’t hear at a party, then what else are you missing? Getting a check-up means you are doing something about it and that’s good. If the answer is an age-related hearing condition, a hearing test tells you what you everything you need to know and whether hearing aids might turn you into the life of the party once again.